The ghost of Hugo Chavez may be disappearing, albeit slowly. Congratulations to the opposition for continuing to fight against the dictatorial regime under Chavez’s successor, Nicolas Maduro. Obama Sanctions Venezuela, but Not Cuba? Talk about a confusing foreign policy. So Obama responds with sanctions on Venezuela, but inches closer to Venezuelan ally Cuba? 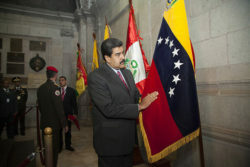 Venezuela has been known to bankroll Cuba under previous dictator Hugo Chavez. The “socialist paradise” promised by late Venezuelan dictator Hugo Chavez has quickly turned into a nightmare as oil prices plunged.